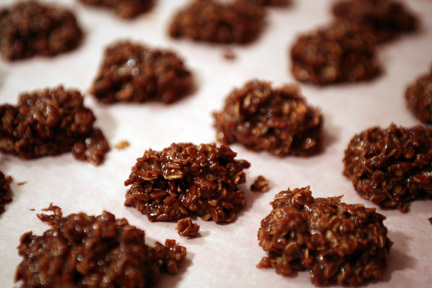 Well, the poor little No Bake Cookies never hardened. I figured out why with the help of my very wise (and somewhat disappointed) hubby. I wandered into the office to sheepishly confess that I had "slightly modified" the cookies to "try and make them a little healthier" while he gave me a blank look and simply asked "WHY?". Fair enough. I explained that I wanted to substitute honey for some of the sugar in the recipe, and that since I was adding a liquid I felt like I should subtract some liquid from the recipe. Makes sense, right? Well, the liquid I decided to subtract was butter (which was to be melted before adding to the cookie mix). "But the butter is what holds them together and makes them firm up!" Right. Point taken. Mix cocoa, sugar, butter and milk in a medium saucepan and simmer for 2 minutes. Remove from heat and add peanut butter, vanilla and oatmeal. Spoon onto wax paper or foil until set, 1-2 hours. So easy, so tasty...so going to be making them soon because now I have a CRAVING!! !